This year’s International Museum Day theme, “Museums and contested histories: Saying the unspeakable in museum”, highlights the essential role of museums as promoters of the free flow of ideas and knowledge, contributing to a more informed society. As part of its International Museum Day celebrations, UNESCO is hosting a round table on the Reproduction of Art and Cultural Heritage (ReACH) project launched by the Victoria & Albert Museum in London and a FacebookLive museum chat as part of UNESCO’s global social media campaign #Unite4Heritage. UNESCO will also be open to the general public for the European Night of Museums on 20 May. Later, in June, UNESCO will also co-organize the International Museum Week 2017 social media campaign. Since its inception, UNESCO has recognized museums as one of its most important partners for building peace in the minds of women and men. Today museums specialize in everything from human ingenuity and cultural expressions to natural heritage. They may be indoors, open-air, underwater and virtual, attracting and inspiring millions of visitors each day. As museum attendance continues to grow around the world, UNESCO is working to link their work with sustainable development and peacebuilding. Museums can not only boost local economies, they can serve as important spaces for cultural mediation and dialogue. Through the use of new technologies, museums play an essential role in democratizing access to culture. In recent years, museums have been targeted, looted and attacked for embodying these values of diversity, dialogue and openness. In response, UNESCO will continue to assist museums and professionals in Iraq, Libya, Mali and Syria, among others, with capacity-building workshops, training materials and guidelines. 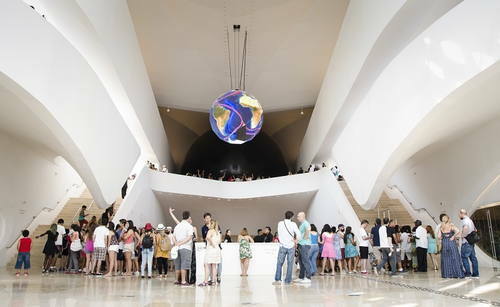 Following the adoption of the 2015 UNESCO Recommendation concerning the Protection and Promotion of Museums, their Diversity and their Role in Society, the Organization has been working with governments, local actors and museum professionals across the globe to support its implementation, particularly as relates to preservation, education, communication, economy and quality of life. As part of these efforts, UNESCO established a High Level Forum on Museums, which met for the first time in Shenzhen, China, in November 2016 and resulted in the adoption of the Shenzhen Declaration, which stresses the importance of museums in reinforcing ethical, professional and technological standards, preserving heritage in times of peace and conflict, and increasing international cooperation.